2019’s Prom is fast approaching! Much is planned for this year, including some new additions to the experience. Prom is set for April 13 for juniors and seniors, with the red carpet arrival beginning at 4:45 p.m. at the Fisher Community Center. 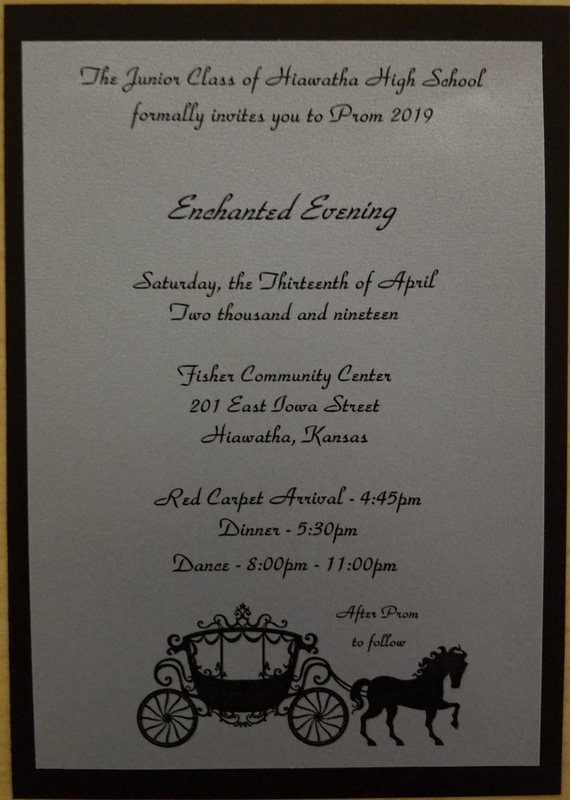 The theme of this year's prom is Enchanted Evening. Decorations will be fairy tale-esque and include a castle. There are a few new aspects with the Red Carpet Arrival this year. Junior Class Sponsor Kathy Kliewer stated that there will be red carpet for the students to walk down, unlike in previous years. A special thanks goes out to Carpet Plus, who donated the carpet for HHS to use for years to come. There will also be two sets of bleachers on each side of the carpet instead of the usual three on one side. “[This] makes it look like a bigger crowd for [the students], which I think will be nice,” stated Kliewer. Community members are welcome to attend the Red Carpet Arrival. After the walk-in, students and staff will participate in the banquet, also held at the Fisher Community Center. Select sophomores will be directing students to their respective tables and serving the meal. The meal will consist of brisket, green beans, mashed potatoes and a roll. The desert will be cherry cheesecake and the drinks served will be tea, water and lemonade. Smokin’ Gringos BBQ from Kansas City will be catering the dinner, courtesy of Craig Lay. Prom King and Queen will be announced following the meal. This year’s candidates include Jasmine Morey, Caleb Pilcher, Felicity Thomas-Rodecap, Daniel Monhollon, Nicole Twombly, and Trevor Pederson. Following the banquet will be class pictures at the Brown County Courthouse. The dance will begin at 8:00 p.m. at the Fisher Center, and will last until 11:00 p.m. Sophomore prom servers will be running a snack table during the dance. When the dance concludes, students will head to Power Play in Kansas City for After Prom. They will ride in charter buses. This prom is sure to be an enchanting experience for all involved.